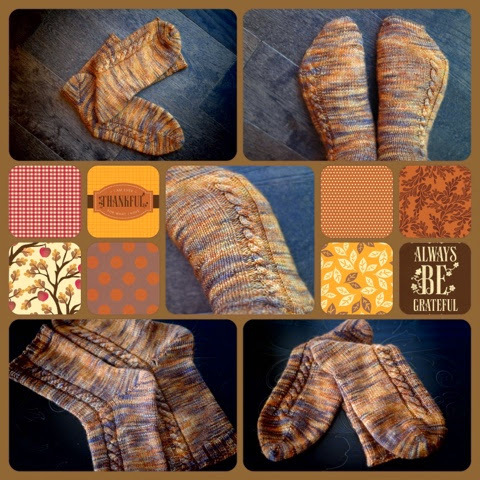 I finished these socks this week and they are just in time for Thanksgiving. 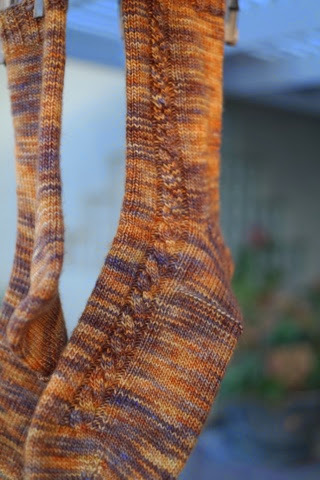 Doesn't the yarn remind you of the color of fallen leaves? 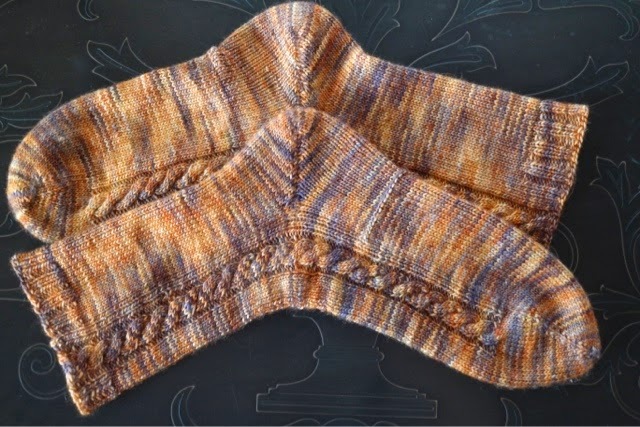 This simple pattern was my first cable stitch pattern. The pattern was easy to follow but I still made so many mistakes. 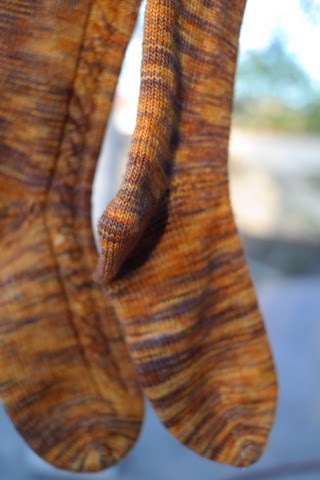 My problem with knitting mistakes is that if I try to correct them I end up with an even bigger mistake, thus the visible hole in one of the heel joins. I also ended up with a weird row on the back of one sock, but heck, they're socks for me, and they go on my feelt. I'm easy like that. One thing I learned while making these socks is I like to start with a 16 stitch toe cast on; that seems to fit my foot a little better. You can see the sock on my left foot was started with a narrower toe, Each pair is a new learning experience for me. Here's a close up view. 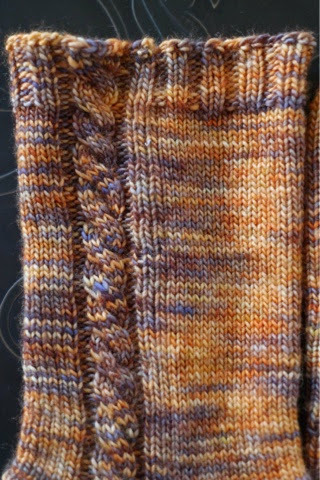 You can see the beauty of this yarn and the simple cable that goes up the side of each sock. Socks hanging on the line are also pretty. This was after they were soaked and blocked. For my next pair I am going to try double pointed needles and start top down. Daring, I know! This is another tick on my 4Q Finish Along list. Only one more project to complete. Bingo! I think I may have said this before, but you are quite the sock Queen! These are such a beautiful colour! I look forward to hearing about your 'top down' experience! I'm sure you'll nail it! Gordon says I spend more time going backwards than forwards! Probably because I'm watching TV at the time! So pretty!! Where do you get that yarn? I LOVE my socks and have even been wearing them just around the house because they keep my feet so cozy and warm.